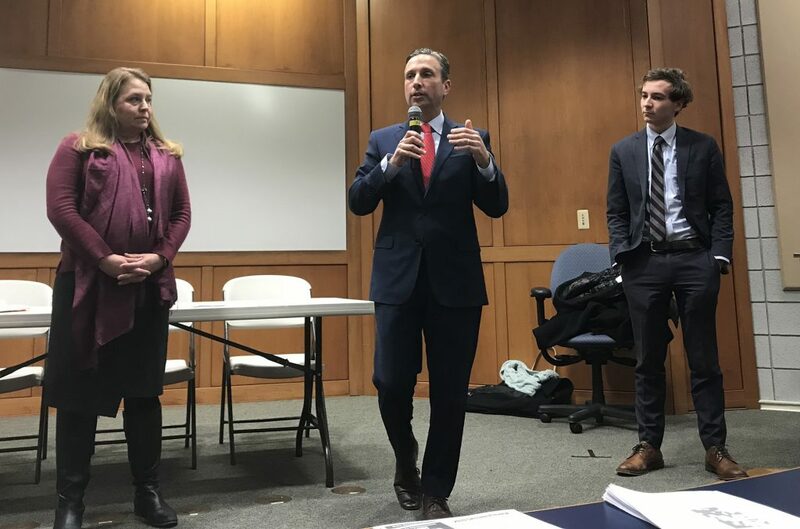 From left, State Rep. Lucy Dathan (D-142), State Senate Majority Leader Bob Duff (D-25) and State Sen. Will Haskell (D-26) address constituents, Thursday at Norwalk Community College. NORWALK, Conn. – Bob Duff does not have an opinion on the proposal to merge school districts along probate lines, he repeated multiple times to a hostile crowd Thursday at Norwalk Community College. It’s not his bill, the State Senate Majority Leader (D-25) said at the community town hall attended by about 50 people, where State Rep. Lucy Dathan (D-142) and State Sen. Will Haskell (D-26) joined with Duff in emphasizing that there’s a legislative process, and it’s just begun. “This is truly the first possible phase of a bill,” Haskell said, after a barrage of comments from citizens upset about State Senate President Martin Looney’s bill proposing a Commission study the concept of combining school districts with fewer than 40,000 residents. Some viewed Duff’s bill, which would combine school districts with fewer than 2,000 students, with suspicion as well. Duff said 5,000 bills have been submitted and will be sifted through by 21 committees, with maybe 250 going on to become law. The main objective of the six-month session is the state budget and when the legislature reconvenes in February 2020, individual legislators will not be able to submit legislation, in that year Committees will submit legislation, he said. Bills are conversation starters and Looney’s bill – SB 454 – has obviously created conversation, he said. Neither bill means that there will be busing, according to Duff. There are school districts with 60-150 students and yet they have a superintendent making $250,000 a year, Duff said. “I gave you that,” he said, drawing a scoff from one man. “The way all bills are presented at this stage is inflammatory … This is a severe problem within the state: 5,000 bills without explanation, some one sentence long. It just seems very dangerous,” he said. Haskell said he has deep respect for Looney but within hours of the bill coming out, he and Dathan announced they were against it. The only one of the towns he represents that would be affected by Duff’s bill is Redding, but he called and found that Redding has shared a superintendent with Easton and Region 9 for maybe 40 years, and “it has resulted in real cost savings,” he said. “I have seen an unbelievable outpouring of opposition against this bill,” Haskell said, commenting that 200 people were at a similar town hall in Wilton. “I don’t know that that would work. But again, I’ll be happy to talk about my bill. I am not going to talk about Sen. Looney’s bill,” Duff replied. Pressed further, he said the bill would create a Commission to study the idea. “The thing could live, it could die, it could change at a public hearing, do all those things. That’s why I introduced my bill. I will be happy to talk about my bill,” Duff said. “I am from Norwalk, and how do you know that we want to have our district combined with your district?” Duff replied. “That was actually my question: do you support it?” she replied. “That’s a terrible answer,” another audience member said. They never talked about the concept either, he said. No districts will be forced to combine under Duff’s bill, because “You have five years to do so,” he said, drawing laughter from the crowd. “If you can’t do it you have to tell the Department of Education why you can’t do it. It doesn’t take away your education funding, although I think it should,” Duff said. “The bill is just starting,” he said. Crafting legislation is nothing like Schoolhouse Rock, Haskell said. Legislators were sworn in on Jan. 8 and the deadline to propose bills was Jan. 18. The bill could eventually say districts consolidate superintendents. “There’s a lot variables, that’s what we’re waiting to hear,” Duff said. The longtime Norwalk legislator said he doesn’t know how much money would be saved because the research hasn’t been done yet. “I want to see how much we can save and if we can have better student outcomes, if we can have better test scores and if we can save money on the ECS formula and put it in places where we have lower achievement,” Duff said. He has no intention, personally, of backing off of the 2,000 number, he said, addressing a Wilton resident. Unlike Senator Haskell, State Senate Majority Leader Duff never directly said he didn’t support Looney’s SB454. Senator Duff, stand up for Norwalk for a change! Duff’s ‘never had a conversation’ with Senator Looney about a school consolidation bill that will directly and negatively impact Norwalk, the town he represents, and its neighbor Wilton. SB454 is more than a ‘conversation starter’–SB454 will effectively deflate property values in both Wilton and Norwalk. Words Hurt. Uncertainty in education is not a good pitch. Norwalk already has enough problems, although often undeserved, attracting new homeowners to Norwalk for its public schools. Wow, this state is so screwed. “Crafting legislation is nothing like School House rock”, said Haskell. Their contempt for tax payers is so overwhelming they don’t even care that these bills are grammatically or contextually incorrect. For one Looney’s bill meant to say 40,000 residents instead of students. Dathan’s bill says “mandate” late start times in one sentence, then says “allow” late start times in the next sentence. Which is it? Watching this session unfold really tells a lot about how dysfunctional we have become and how incompetent our leaders are statewide. Mr. Duff says the main objective of the six month session is the budget. Everyone who hasn’t been asleep for the last several years knows what a financial disaster our budgets have been and yet here what we get is 5000 bills that all cost money. Here’s a stupid idea. How about focusing on fixing the budget before continuing the insanity of spending us into oblivion and with it our jobs and property values. Interesting choice of words by Haskell. He may be opposed to the Looney bill but he obviously supports regionalization. “When we regionalize it has to be in the best interest of our students,” Haskell said. Join us in our petition to stop school regionalization. Haskell needs his own lesson. The kid has yet to experience life, he has never owned property, never managed a staff, files a 1040EZ, hasn’t risked his own capital, hasn’t run a business, never married, has no children – what has he done that he can instruct we? I rarely agree with Bob these days, but we have to start getting some economies of scale. Having ~169 districts, police and fire departments, pensions and health care benefits, etc. is bankrupting the state and cities. We all pay for it one way or another – be it in property, income, sales or whatever other thing the state wants to tax. Discussions about ‘sharing’ and consolidation have to start somewhere. Consider this, since 2012-13, Norwalk added 500 students – nearly 5% growth. Our percentage of poverty or free and reduced lunch students increased from 47% to 57% in that timeframe as well. Yet, Stantec (the company preparing the POCD) says the city has only grown by a half percent in the last decade. Hmmm… seems to me, we’re growing poverty in our schools. Nowhere else in the US is income so overtly segregated, as it is in Connecticut’s purposeful approach to town and school districting. Perhaps that is why there are no jobs. What corporation wants to be in a state that has so neglected its cities? Kids, whether educated in Norwalk or Wilton are unlikely to return to a state with such few job prospects. Lacking future young talent, as well as a punitive tax structure (to compensate for our inept micro management) is why big business has left and continues to leave. How much longer can Norwalk survive when our largest employer is the City of Norwalk or where future jobs will be minimum wage from the mall? Those ‘Hate Has No Home Here Signs,’ so prevalent in our leafy neighboring towns has always made me laugh. Now, even more so. The uproar surrounding this bill is the clearest indication that we still have a long way to go on race relations. No matter how slick your arguments opposing regionalization may be, it still comes down to deep inner racism. I find it humorous to watch Liberals pushing for diversity, BUT not in their neighborhood. It’s time that someone steps up to challenge them. I believe Bob Duff would like to but doesn’t know if he’s got enough support. @ John ONeill, This topic IS ‘complicated, convoluted and crony driven’ and goes beyond the intersecting issues of improving race relations, regionalization of schools or saving costs. Norwalk has borne the brunt of failed mandates, ECS funding and other education policies from Hartford, with middle class taxpayers bearing the brunt. In order to have a REAL economic discussion about savings amongst municipalities, we would need to open up union contracts. Each of our ~169 towns have multiple insurance plans, pension plans, work rules and labor contracts. For everyone to set their hair on fire, seems counter productive to the financial mess we’re in. While a conversation needs to START, I’d prefer to not have it DICTATED to by Hartford, but instead create state incentives that would encourage discussions to start at local levels to see where synergies exist. What a clown show that was last night. Absolutely shocking at the contempt our law makers have for taxpayers. I can’t type fast enough to recap the debacle. One Wilton resident cited detailed statues that said the bills are illegal – very insightful. Response from Duff: “I’m only here to talk about my bill”. I told them pro or against, the optics of 5,000 bills, 1 of which is a 94 word run on sentence Bob submitted, is pathetic. I said I’d be fired if I showed up in my managers office with such a poorly prepared proposal with zero facts as basis. He said “his bill has a 5 year phase in” I replied, there is NO mention of ANY numbers in your 94 word Bill. I questioned the importance of his bill about stopping rabbits being sold in pet stores. He said it may sound weird to me but others it is important. I’d like to know who is leading the Ban Rabbit Brigade but I didn’t ask. I added that the priorities are non existent as our state swirls down the toilet bowl. Duff said the 2 school bills would “save money…cut costs…” I asked him what the savings is then, in a dollar figure, he had no answer. Then Haskell chimed in that legislators don’t put forth numbers, a bi-partisan group gathers the numbers. What a joke. Then, a member of the audience asked “do you have a range of savings?” Dodged the question. “How about a percent” Dodged the question. They have no clue. Dathan read from her postcard mailer. Haskel seems fresh but woefully unprepared for the realities of life, let alone leading. He thinks “ammunition should not be free”. I don’t own a gun but I’d like to know where in the State of CT free ammo is being handed out. Duff said he NEVER knew about Looney’s bill. Never talked to him. Never heard from him. Saw the bill for the first time when we all did. You tell me – Duff and Looney are both Democrats and very high up in the food chain and their bills were numbered VERY close sequentially which someone informed me means they were submitted close in time. Duff – bill 457, Looney – bill 454. You mean to tell me these guys were not in contact about the scheme they planned to submit? Folks, for or against WHATEVER these politicians put forth, the process and lack of any coherence is unacceptable. They do not grasp what life in the private sector is and why for example it is best for Wolcott,CT or Whereversville, CT to simply pick up the phone to discuss consolidation vs. it being forced down taxpayers throats. If the taxes go higher in those towns with alleged $200,000 superintendents for 30 kids, people will vote with their wallets and feet and put said town out of the education “business” as the market corrects itself while the town’s school system sinks or swims. If anyone has audio of last night, I’d love to dissect it as Exhibit A of this nonsense. Thanks Nancy for the coverage! Well said Kevin! Why Norwalk taxpayers haven’t revolted sooner over the punitive and unquantifiable policies of Hartford is beyond me. There are over 5000 signatures on the petition against these bills, likely Wilton residents. When is the middle class of Norwalk going to revolt at the prospect of facing a 67% free and reduced lunch population in years to come – effectively picking up the tab for our wealthier suburban neighbors, all while our land use policies subsidize developers to build more apartments? I for one am glad this education discussion is finally taking place. It’s time to rip the bandaid off. I agree with Lisa Brinton and Bob in the general principle that our current system is woefully inefficient with too many small school districts. There is the other issue that our property tax system forces each municipality to fund its schools (and only its schools). This creates enormous financial advantages for the already advantaged/wealthy suburban towns and districts. The Cities have the high needs population = students who cost a lot more to educate. The cities typically have a less affluent base of residents less able to pay the higher cost to educate these students. Yet our education funding system lets the suburban districts skate on these very real costs. Wow, Kevin Kane. Thank you for the recap for those of us who wanted to attend but couldn’t get there. Thanks too for asking the hard questions. And thank you as always, Nancy, for the great coverage. Such a complex subject matter. Agree that CT as a state has to start getting some appropriately scaled economies established from school district to school district, and whether some of these smaller surrounding towns want to hear it or not, discussions about consolidation and pooling of resources might have to start somewhere to cut unnecessary spending in school sytems. Look at Redding and Easton consolidating. Maybe not a bad idea? Not sure what to think. Appears that integration is a scary word to our neighboring towns. Their insular bubbles have been poked at and threatened with this proposal. I cannot help but remember the “Build the Wall!” chants by Wilton high school students to Danbury guests at a home football game. It is a sad day in CT when Duff had to mention at this gathering that this regionalization proposal would not be about “busing”, to appease an uneasy Wilton resident. Brings to mind the busing that took place in the Seventies in Boston, which did not fare so well. Perhaps regionalization, if done and done right, could chip away at the segregation and bring the communities together, while producing a more cost efficient, equitable education benefiting both communities. Tricky though as Norwalk has such a complex, broad range of educational needs and cannot be fitted into a one size fits all template. If regionalization means templating Norwalk and taking away power of local decision making for our children from our Superintendent, BoE, our principals, administrators, teachers, etc., than I can’t get behind that. The comments on the petition are something else. Panic mode. Looney has brought out some loonies! This decision belongs with the municipality and not the state which like so many of Hartford’s policies has driven CT into the financial abyss. Why can’t Hartford quit being beholden to unions or simply cut spending and promote personal responsibility rather than holding on to and expanding every welfare program imaginable? Anytime you hear that property taxes are unfair you better hold on to your wallet. . . this paves the way for more wealth confiscation and redistribution. What’s next, local income taxes or masking bailouts by promoting a regionalization county scheme to bail out financially insolvent cities ? Holy cows…….Duff said there are over 2,000 proposed bills that have been submitted for consideration, of which 250 might become law! What the heck is going on in Hartford? Why in the world do we need so many new laws every year. This is just crazy and confirms how out of control things are up at the state capital. Can’t afford or even enforce many of the ones we already have, but let’s come up with more. What a joke this state has become under years of democrat control. Time to move. Townie: I have to tell you — Based on your moniker, I can’t believe you’ll be moving soon..Other than that, I agree. Why are there 4 different water providers, 3 of them quasi government agencies. I guess I’m not so clear why so many in Wilton are in arms about Duff’s proposal. Wilton is close to 2x the 2000 student population he proposed, there’s no way that Wilton enrollment will be anywhere near 2000 students in the next dozen and more years. I know there was a proposal based on a 40,000 person population but that’s not Duff’s and my assumption based on statement’s made by Duff herein is that he’d be more likely to reduce rather than increase the threshold number. At what point should a district be forced to choose between losing State $ or consolidating offices? The business world does this all the time. On the one hand loads of people complain that government is bloated and runs inefficiently but then when government acts like a private business and seeks to cut overhead the same people balk that communities should have total control (even if they get subsidized). @Steve. No we just don’t trust Duff to get it done. 16 years and he’s now realizing the waste? When are you going to do the same and stop giving free passes to the same losing policies? It was a great article , The Hour had it as a gun violence meeting. I support consolidation/regionalization to save money. What’s the big deal? Let them study the numbers. If they can save money, have at it. Accessing CT state funding should certainly be tied with compliance with money saving measures. All the upset about the bill language etc seems petty and like an attempt to fluff up complaints/ undermine ideas. Of course there are people who fear integration of districts, even if theirs is unlikely to be affected, and even if integration would decrease segregation. They want to have their cake and eat it too, even if their cake has turned moldy. And they don’t want anyone trying to get close to take a piece of their moldy cake. SAD.